I previously wrote about how easy it is to describe a GLAM collection item in Wikidata: it’s quicker than writing a blog post in WordPress and the resulting data are endlessly reusable. This time I’ll go into more detail about using Wikidata’s interface to describe items from museum collections, and announcing a new tool to browse the aggregated collection. The Museum of the History of Science recently shared catalogue data about its outstanding collection of 165 astrolabes on Wikidata. Although Wikidata already had the power to describe astrolabes, very few had been entered, so this donation is a huge leap forward. If nothing comes to mind when I say “astrolabes”, here’s an image gallery generated by a query on Wikidata. Astronomical Instruments” and describe it in Wikidata. Having checked that it isn’t already there, I click “Create new item” on the left hand side of any Wikidata page. At first I’ll be asked for a name and one-line description in my chosen language. Now to describe the object’s properties. Each property is introduced by clicking “add statement”. The first property we have to add is “instance of”. If the object is a part rather than a complete astrolabe, Wikidata has identifiers for the rete (or “spider”), mater (or “motherdisk”) and plate (or “latitude disk”: it’s important not to use any of the other kinds of plate). So while I am working in English, other users can be working in German, Arabic, or 300 other languages but we are using the same data model and making statements that are visible to each other. Paris, Bibliothèque Nationale, Département des Cartes et Plans: •. Provenance? Brass. Diameter: 129 mm. Thickness: • mm. Signed. Undated. This allows us to specify the Collection, Material used and Diameter properties: A diameter is a number plus a unit of measurement. This astrolabe was made by Aḥmad ibn Khalaf for Jaʿfar, son of (the Abbasid Caliph) al-Muktafī bi-llāh. The instrument is undated but the Caliph ruled from 289 to 295 H [= 902-908], and his son lived from 294 to 377 H [=906-987]. This allows us to say that the object dates from the 10th century. In Wikidata, the date when something is created or comes into existence is called its inception. An astrolabe can be a literary work as well as a scientific instrument, with text relating to its religious or ceremonial function. From the context, it’s apparent that this object’s markings are in Arabic. The relevant property is “language of work or name”. 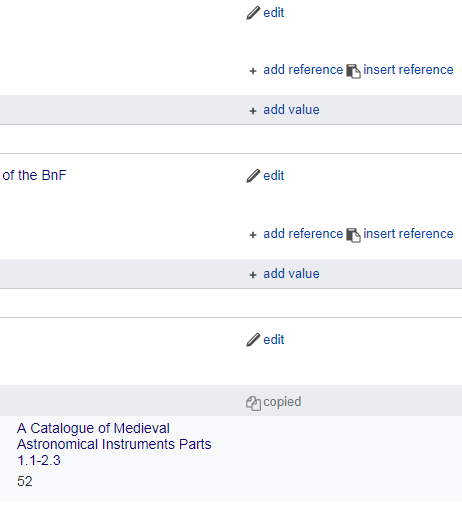 The King catalogue entry has a lot more detail and analysis than this, but this new Wikidata item captures the key facts about what the astrolabe is and how it is connected to people and places. So far I’ve made some statements without saying where they came from or why they should be trusted. The next step is to add a reference. If I were basing the statements on a record in an online catalogue, I could enter the catalogue link as Reference URL. In this case, I’ve made a bibliographic representation of the King catalogue. The “stated in” property is what links the fact with the publication where it can be verified. Rather than enter the same reference for every statement, there is a copy-and-paste process. (Edit) Hat tip to Daniel Mietchen for pointing out that this feature is available because I’ve activated the relevant gadget under “Gadgets” in my Wikidata Preferences. DuplicateReferences: Adds a link to copy references and add them to other statements on the same item. “Insert reference” links should appear next to all the other statements. Click those. Now all the newly added statements have verifiable references. What happens if sources differ? In Wikidata, conflicting statements should both be represented, each with citations to their respective sources. If there is academic controversy about a statement, Wikidata’s role is not to decide the final truth but to express that controversy to the user. If I had my own astrolabe in a private collection, I would first describe it in a publication, or at least in some place visible on the Web, then use that publication or site as a source for Wikidata statements about the item. location: normally the place where an item exists physically can be inferred from its collection, but the location property can be used if they differ. For example, an item might be catalogued by one institution but on display in another. If the item is in a private collection, the location property can identify the city or country. workshop of: useful if the individual maker is not known. For example, some of the MHS astrolabes are from the workshop of Jean Fusoris. inscription: this is for short strings in the original language. This poses a minor problem in that sources often only give a translation of the inscription, which is incompatible with this property. script: if the inscription on the astrolabe uses an identifiable script such as Naskh, this can be represented. depicts: anything that is artistically depicted on the astrolabe can be linked here. described at URL: This can be used to link the item’s official online catalogue record, but could be another online database. described by source: We’ve seen that individual statements can be cited to a given source, but if there is a paper or article that gives general information about the item, it can be cited here. image: if there is an image on Wikimedia Commons, its file name can be added. This allows database queries to be returned in the form of image galleries, like the one at the start of this blog post. Unfortunately this does not work for images on other servers. Commons category: if there is a set of images on Commons, not just one, the link for that set of images can go here. This astrolabe from the Conservatoire national des Arts et Métiers has seven images on Commons. Here is an example of a Wikidata item in use on Wikimedia Commons to identify the astrolabe depicted in a photograph. Everything above “Description” is imported from Wikidata. The Date/ Source/ Author fields near the foot of the box refer to the photograph rather than to the object itself. Note that the diameter that was entered as 220 mm has been automatically converted to inches, and the institution name “Maps and Plans Department of the BnF” has been automaticallly linked to further information including its official web site. Reasonator is an application that displays information from Wikidata related to a given entity. Looking up the British firm W. Watson & Son, the profile shows their five astrolabes that are in the MHS collection. The SPARQL query language allows us to ask targeted questions. For example, we can request astrolabes associated with a specific person or a location, getting the results as an image gallery, a timeline or a map. Since not everybody knows SPARQL, a way to make this easier for the general public is to build a custom application. I’ve taken the first steps towards this by creating Astrolabe Explorer, a set of canned queries. Update: After a bit more development, the queries are joined up, so clicking on a location in the map brings up an image gallery of astrolabes produced at that location, and similarly for clicking on a person’s name. As well as improving the interface, I would like to explore bulk importing of data from the David King catalogues to build towards a comprehensive catalogue of astrolabes in the world’s museums and private collections. You can help! 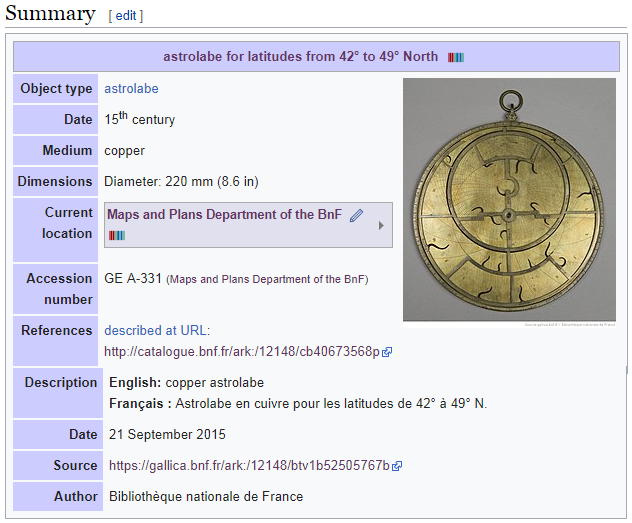 As an exercise for the reader, find an astrolabe in your favourite museum catalogue, or find one of the astrolabes photographed on Wikimedia Commons, check Astrolabe Explorer to confirm that it is not already in Wikidata, then add it using the process I’ve described here. This entry was posted in digital scholarship by poulterm. Bookmark the permalink.